Gaining weight is no easy task for some, which is why having the right supplements helps get the job done. Whether you're trying to gain muscle mass to look shredded or simply want to reach a healthy body weight, using some of the top weight gain supplements is a step in the right direction. Looking for something that'll help you pack on pounds without fillers or ingredients you may be allergic to? 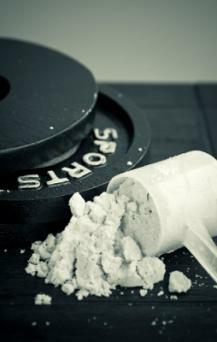 Try Naked Mass all-natural weight gainer protein powder, which is just what you need to get the job done. This product contains just three ingredients: casein, whey, and maltodextrin made from organic (gluten-free) tapioca. You won't find artificial flavors or colors, artificial sweeteners, GMO, soy, gluten, or growth hormone in this weight gain supplement, and OnlineStrength.com gives Naked Mass a 5-star quality rating. Naked Mass helps pack on pounds because in each serving you'll consume a whopping 1,250 calories, 252 grams of carbs, and 50 grams of protein (but just 5 grams of sugar). You'll be getting the calories, carbs, and protein needed to build mass, especially muscle mass when you're lifting weights regularly. You can purchase Naked Mass, which received a 4.4 out of 5-star rating on Amazon, online or from nutrition supplement stores. You'll pay just over $60 for an 8-pound container and can choose from chocolate, vanilla, and unflavored protein powders. Mix the protein powder with liquid (water and ice or milk). Receiving an 8.4 out of 10 rating and making Bodybuilding.com's top 10 list for 2017, Serious Mass protein powder made by Optimum Nutrition is one of the best you'll find when you want to pack on muscle mass. This product also earned Bodybuilding.com's Award of Excellence. In each serving, you'll be getting 1,250 calories, 250 grams of carbs, muscle-building creatine, glutamic acid, glutamine, and 25 minerals and vitamins, which is an ideal combination for mass building. When using Serious Mass, you'll consume a variety of proteins including whey isolates, whey concentrate, egg, and casein proteins. Choose from different flavors, such as strawberry, vanilla, chocolate, banana, cookies 'n cream, and chocolate peanut butter. You'll pay about $48 for a 12-pound container of Serious Mass and can purchase it online or in specialty supplement or nutrition stores. Mix the powder with milk or water. Another weight gain supplement that's rated one of the best (and given a 5 out of 5-star rating by Tigerfitness.com) is called True Mass 1,200 made by BSN. You'll pay $50 for just over 10 pounds of product. You'll be getting 1,220 calories, 50 grams of protein, 12 grams of branched chain amino acids (BCAAs), 25 grams of EAAs (essential amino acids), MTC (medium-chain triglycerides), and 16 grams of fiber in each serving, which is everything you need for proper nutrition and mass gains post- (or pre-) workout. Purchase True Mass online or in nutrition or supplement stores. Enjoy this product mixed with water or milk. Looking for a weight gain supplement that meets your nutritional needs, is high in calories, and helps you move toward a healthier weight (if you're underweight, having difficulty eating, or recovering from an illness or surgery)? Consider Boost High Protein, as recommended by Harvard Health Publications and dietitian Stacey Nelson with Harvard-affiliated Massachusetts General Hospital. Boost High Protein comes in three flavors (chocolate, vanilla and strawberry) and provides you with 240 calories, 15 grams of high-quality protein, vitamins, minerals, and antioxidants. It's also low in saturated fat and free of gluten and lactose. You'll pay $25 to $35 for a 24-pack of Boost High Protein, and you can find it in nutrition stores, major grocery retail chains, pharmacies, or online. For an extra boost of calories, consider Boost Plus shakes containing 360 calories per serving. These shakes are ready to drink! Another top-rated Optimum Nutrition product called Pro Gainer has earned a 9.3 out of 10 rating with Bodybuildling.com. It's more expensive than Optimum Nutrition's Serious Mass (you'll pay $70 for a 10-pound container), but you'll be getting more protein (60 grams) and fewer calories (650) per serving. Likewise, you'll be getting 1/3 of the carbs of Serious Mass (just 85 grams per serving). This combination works well when you want to gain muscle mass only, without the body fat that typically accompanies weight gain. You'll also be getting BCAAs, glutamine, glutamic acid, a vitamin and mineral blend, and a mixture of high-quality proteins (egg, whey and casein). Pick up Pro Gainer online or at your local specialty supplement store. Mix the powder with water or milk. Another nutrition product recommendation by Harvard Health Publications for weight gain due to calorie, carb, protein, and fat ratios is Ensure. Ensure Plus, a shake specifically designed for patients who need to pack on pounds, contains 350 calories, 13 grams of protein, and 26 vitamins and minerals. This product is the #1 doctor-recommended brand among physicians who recommend liquid nutrition supplements to patients. You'll pay about $45 for a 24-pack of Ensure Plus and will have a variety of flavors to choose from (chocolate, vanilla, strawberry, butter pecan, and dark chocolate). Purchase Ensure Plus at major retail chain stores, pharmacies, nutrition stores, or online. This weight-gain supplement is ready to drink! A product receiving a 4.4 out of 5-star rating by Amazon.com customer reviewers, Muscle Milk Gainer is one of the best you'll find. In each 4-scoop serving, you'll get 650 calories, 32 grams of protein, and 3 grams of leucine, which is a ratio that's ideal when you're seeking muscle mass gains. You'll pay about $44 for a 10-pound container of Muscle Milk Gainer when ordering it online. You'll also get to choose from flavors like chocolate, vanilla, and cookies and cream. You may be able to find Muscle Milk products in some grocery store chains but will be sure to see it in nutrition or supplement speciality stores. Mix Muscle Milk Gainer protein powder with milk or water, or look varieties that are made ready-to-drink. Another top-rated product by Bodybuilding.com is called Super Mass Gainer made by Dymatize. In each serving of Super Mass Gainer, you'll be getting 1,250 calories, 52 grams of high-quality protein, 243 grams of carbs, 11 grams of BCAAs, 5 grams of leucine to support muscle growth, vitamins, and minerals. Proteins used in this product are casein and whey. You'll pay $28 for 6 pounds of product when you order Super Mass Gainer online and have a variety of flavors to pick from (chocolate cake, cookies and cream, vanilla, chocolate, sugar cookie, and top-rated strawberry). Simply mix the protein powder with water and ice or ice-cold milk and enjoy! Why Choose Weight Gain Supplements? For some people, it can be difficult to consume enough calories to gain weight, which is why high-calorie supplements come in handy. The weight gain supplements listed above all have something in common: they are high in calories and protein and contain a variety of other nutrients (carbs, healthy fats, vitamins, and minerals) needed to gain weight in a healthy way. 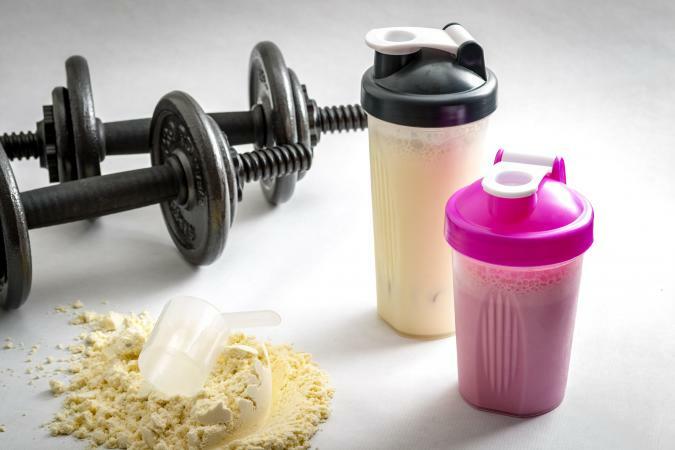 Simply replace a meal with high-calorie shakes if you're having difficulty eating food, or drink weight-gain shakes between meals for an extra calorie boost and as a way to pack on lean muscle mass when you're weight training regularly.